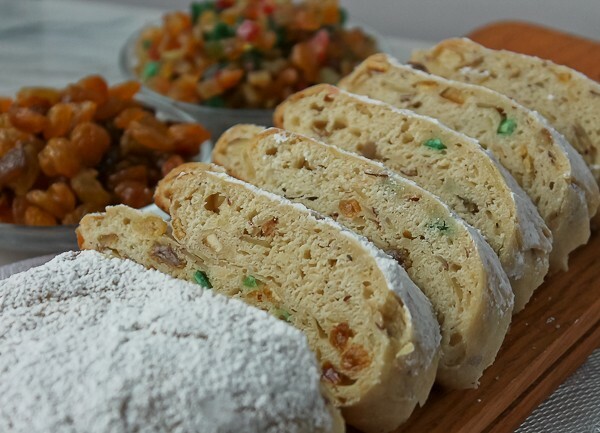 Stollen is a German fruit yeast bread containing dried and/or candied fruit, almonds, spices, citrus peel, rum or brandy, and sometimes almond paste. The finished bread is slathered in butter and covered liberally with powdered sugar. It is a traditional bread eaten during the Christmas season and is celebrated every year in the city of Dresden, Germany on Saturday before the second Sunday of Advent, which is tomorrow, December 5th! In honor of the long-standing tradition, and since I couldn’t be in Dresden to taste a genuine one, I wanted to make a Dresdner Stollen at home. 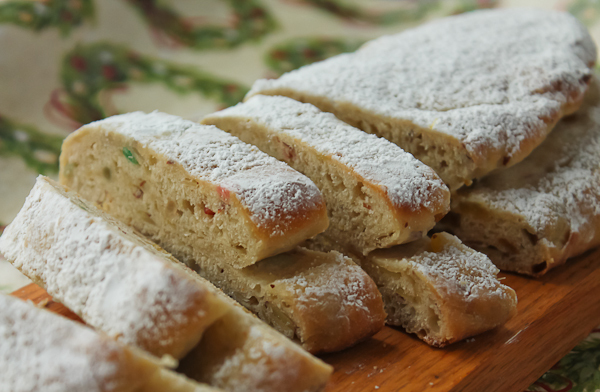 It is said that the first stollen was baked in the 15th century when the bakers of Dresden offered their rulers a huge Christmas bread and the tradition has continued ever since. However, back then, the bread only consisted of water, flour, and yeast because the catholic rules did not allow the use of milk or butter during Christmas time. But thank goodness that changed and now this incredible stollen as we know it today has developed. To celebrate the bread at the festival, a 3-ton stollen is carried in a parade through the city and then cut into small pieces for all the crowd to taste and enjoy. To watch a video of the festivities go here. 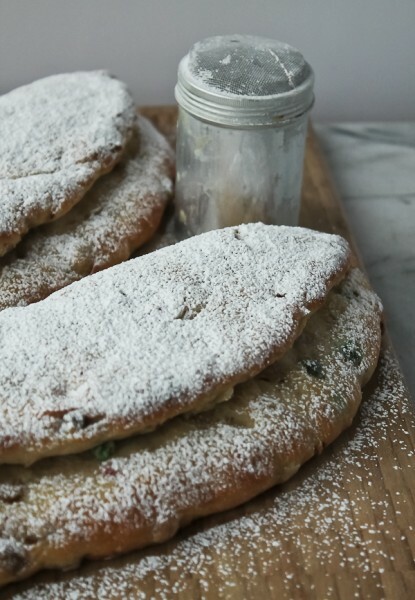 You will find many recipes for stollen in cookbooks and on the web. I have already tried two different recipes, this one being from a December 1977 Better Homes and Gardens magazine article about Christmas recipes from bakeries around the country. It makes two gorgeous stollens and is not difficult to make, it just takes some time, but time well worth it! First some chopped candied citron and golden raisins are soaked in rum overnight. The next day a cup of flour is mixed with three packages of yeast and some warm milk, then set aside for an hour. While that mixture is setting, another mixture is made of butter, sugar, egg, a small amount of almond paste, salt, lemon peel, vanilla, and nutmeg. It is then beaten into the flour mixture along with the macerated fruits. Now it’s time to knead it all together for the first rising. It is then punched down, divided in half, formed into the stollens, and rises again. It is finally time for the baking which only takes about 20 minutes. When the stollens come out of the oven, they are immediately brushed generously with melted butter and doused with powdered sugar, and then more powdered sugar after they have cooled. The stollen is ready to slice and eat for breakfast or a coffee time treat. It cuts like a dream; so moist and tender. 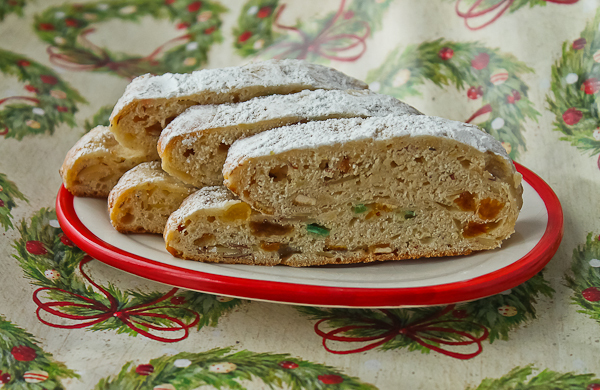 Stollen also makes a wonderful Christmas gift from the heart. Homemade items are always welcomed, especially one this special! If anyone has ever been to the Stollen Festival in Dresden, I would love to hear about it! It is on my travel list of places I must go someday. In the meantime, I’ll keep making stollen every year, and hope you will give it a try too. Soak candied citron and raisins in rum overnight. In large bowl of electric mixer, combine 1 cup of the flour and the yeast. Add the warm milk and beat until smooth. Cover and let stand at room temperature in a warm place for 1 hour. Meanwhile, in a small mixing bowl, cream together the ½ cup butter, granulated sugar, egg, almond paste, salt, lemon peel, vanilla, and nutmeg. Beat into the flour mixture. Stir in the fruit and rum, and sliced toasted almonds. By hand, stir in enough of the remaining flour to make a moderately stiff dough. (I used 2 cups of the flour, then used the last cup or slightly more if needed, to coat the work surface while kneading. Be gentle, yet firm with the dough, but you still want it slightly soft and not too stiff). Knead the dough about 5-8 minutes or until smooth and elastic. Shape into a ball and place in a greased bowl, turning over to coat surface. Cover and let rise in a warm place about 1-1/2 hours or until doubled. Punch dough down; divide in half. Cover and let rest for 10 minutes. Roll each half into a 10-by-7-inch oval. Fold long side of oval to within ½ inch of opposite side; seal edge. Place on greased or parchment-lined baking sheet. Cover and let rise in a warm place about 1 hour or until doubled. Bake in a 375 degree F oven for 20 minutes or until golden. 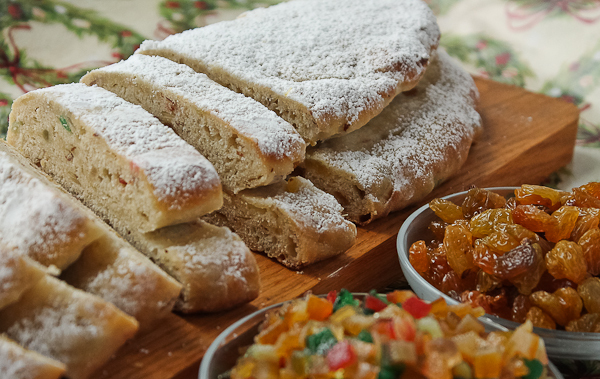 Brush the warm stollen generously with melted butter. 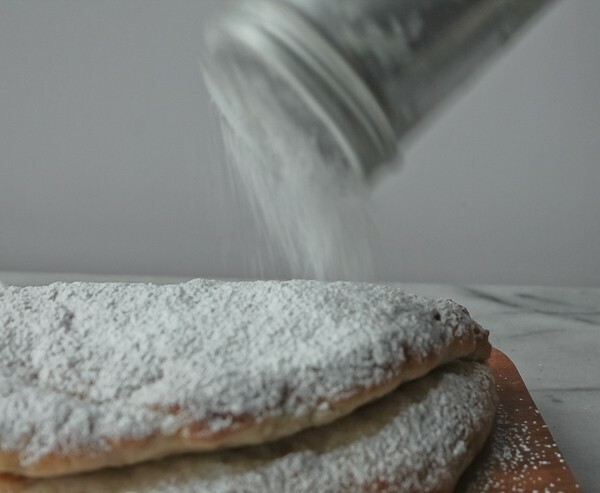 Dust with some powdered sugar and let cool on wire racks. Before serving, liberally dust with more powdered sugar to coat. Makes 2 loaves.